​Multiple reports have been issued on the threat of “palm oil to primates” in Africa. The most recent one warns that “few areas reconcile high yields and primate protection.” The report has been shared widely but while it’s true that palm oil development in Africa will lead to the loss of some forests, the key question should be if monkeys and apes will fare better if palm oil was not developed at all. The desk top study did conclude that there was over 3 million hectares that could be developed impact with minimal impact. This point seems to have been lost amidst pop media’s rush to get the news out about palm oil’s latest threat to primates. 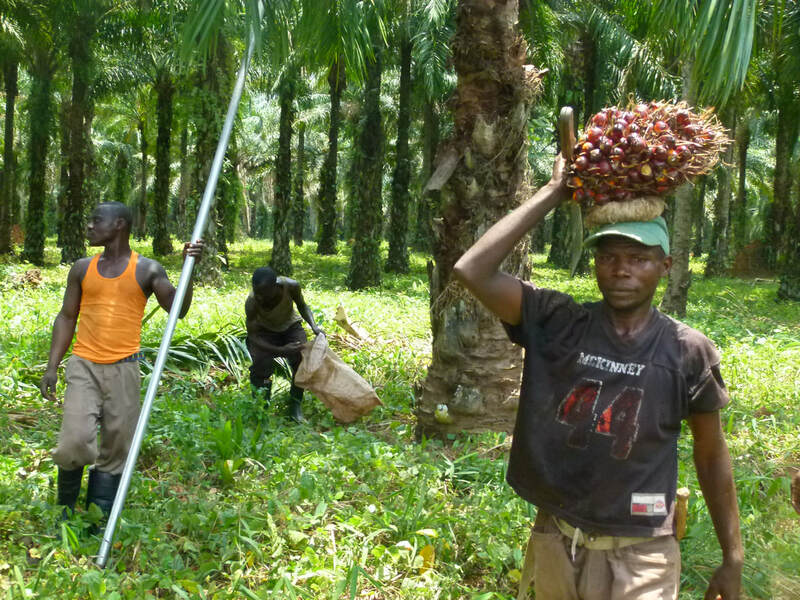 ​If we assume that palm oil was not developed at all in Africa. That the status quo remains where palm oil production is limited to its existing areas. Will this save forests and primates? To answer this question, it is important to look at the state of forests and primates in Africa to determine if large scale industries with their potential to create jobs and export revenues will protect or hasten extinction. Civil strife has the main deterrent for investments into industrialized plantations in Africa. Wars are most likely the reason why so much of the forests in the Congo Basin remain intact but wildlife populations have not been so fortunate. Countries that are part of the Congo Basin include some of the poorest nations in the world. This includes the Democratic Republic of Congo ( DRC ) which ranks as the second poorest in the world, right behind its neighbor, the Central African Republic. Despite the minimal presence of industrial palm oil, the deforestation rate in the DRC is rising. The blame is being placed on farmers looking beyond subsistence farming which was the traditional cause of forest loss. Illegal logging that supplies the global demand for wood continues and has brought with it another great threat to apes, commercial bushmeat. The added threat of oil exploration in Virunga National Park and the absence of any other viable solutions for forests and primates in the DRC supports the call to revive the palm oil industry in the DRC. Can palm oil save primates in Africa? In light of the on-going threats against primates in Africa, industrialized palm oil operations show a strong potential to be a solution. A comprehensive report from FCMC and USAID from 2015 laid out the possibilities for a no-deforestation model that is completely doable in light of degraded lands available. A look at the operations of Feronia which is mentioned in the FCMC/USAID report shows the possibilities and the challenges. Described by one reporter as as “jewel in the jungle,” the firm support by development funds including the UK’s CDC is helping the company to achieve its ambition of becoming the standard for how oil palm companies should operate in the DRC. More information can be found on the 2017 Sustainability Report. Feronia’s operations are unusual in its emphasis on community development and it is most likely the support of development funds that has allowed this enviable position where a listed company worries more about people than profits. In an email discussion with Paul Dulieu, we sought an update on the ground situation. In keeping with the level of transparency which the company adheres to, company responses are published in full without edit. CSPO Watch: Noting reports of low wages for Feronia's workers at USD1.00-1.25. What is the average salary today? Do you have an update on discussions with the unions? What was the conclusion? Are the workers paid by performance/ piece rate and if so, what is the pay per ton? Will the wages be enough to provide a decent living for workers based on costs of living in the area? Feronia: The USD1.00-1.25 per day wage that has been suggested by some is wildly inaccurate. We pay our workers above the rates typical for agribusiness in the DRC, have significantly increased pay since we bought the company from Unilever and will continually improve the position for workers as the business reaches profitability. The wage rates of our workers vary by skill level and length of service, as mandated by Congolese law. Employees receive 12 monthly wage payments and two additional months’ pay in their December pay packet and are paid in Congolese Francs (“CDF”), as is required by DRC law. In the case of our lowest paid workers (unskilled labourers without any experience, who represent approximately 1% of our permanent workforce, during their first year of service) their pay rate is approximately 145% of the DRC’s SMIG (Salaire Minimum Interprofessionnel Garanti - national minimum wage) and our average worker currently earns the CDF equivalent of circa $3.30 per day. - An extensive collective bargaining process took place in 2014 with terms of employment updated and improved despite the very severe financial pressures that came with rebuilding a business that had been substantially destroyed. The collective agreement included pay increases, agreed hours of work, sick pay, overtime, maternity pay, holiday pay, end of service pay, bonuses and assistance towards school fees. Additionally, employees receive free healthcare for themselves and their families, accommodation (or payments in lieu of accommodation) and a statutory wage increase for each full year of service. We seek to maintain a positive climate of employee relations through proactive union relationships, and believe that this is vital if we are to meet the challenges of our business in a constructive manner. We also engage with employees through their line managers and use a variety of other channels to engage with them including group meetings, quarterly newsletters and more informal “toolbox” meetings. An initiative introduced in January 2017 to link pay rates to an independent inflation index and therefore help alleviate the effects of DRC inflation/currency devaluation was a direct response to our workers concerns that the wider economic situation risked causing them hardship. - The majority of our employees are paid according to a daily task rate system where pay correlates to performance, with employees paid extra for over-performance and, conversely, non-attendance or non-performance by an employee can result in an employee’s wages being lower. The daily tasks we set are, by industry standards, low and in some instances less than half of what is required for a comparable elsewhere in Africa. The task rates are deliberately set low in recognition of the fact that our business is still being rebuilt and we have a workforce who, whilst having been employed by the Company for some years, may have relatively little experience of the business operating at industry standard capacity. Management estimate that the average worker can and, in fact, does, complete the tasks it sets in approximately five hours, which enables them to go home before the hottest part of the day. - What our employees are paid each month does depend on them attending work and their level of performance. Non-attendance or non-performance is naturally reflected in their take home pay each month which is in line with many industries throughout the world. However, employees that attend work and do their jobs are paid at a rate that is substantially above the average for workers in the DRC. By way of illustration, the Democratic Republic of the Congo’s Gross Domestic Product Per Capita was circa $1.20 per day in 2016 which was before the recent devaluation of the County’s currency. With average wages at the CDF equivalent of circa $3.30, our average workers earn far in excess of the national average wage and between 50-100% more than teachers or nurses in the DRC. CSPO Watch: Noting complaints of inadequate housing for workers, I assume there are migrant workers or workers that otherwise do not own their own house. What is the percentage of local workers to migrant workers? What are the livelihood options for migrant workers if they didn't find jobs at Feronia? Are worker's families allowed to live with them in company provided housing? Feronia - Apart from a few expatriate managers, all of our workforce are Congolese. - Yes, workers live with their families. - The DRC as a whole has a very high rate of unemployment (estimated at around 85%, although no accurate statistics exist) and we are particularly conscious of the pressures unemployment puts on the environment, society and Feronia as a business in the areas in which we operate. To help tackle this, working with “Community Development Committees” and local NGOs, we are funding a whole series of livelihood projects across our three sites (more information can be found on pages 34 and 35 of our Sustainability Report) to help create more opportunity for income in the areas in which we operate. It should also be noted that, with our operations being very remote, they do create micro economies where people who do not work for the Company provide goods and services to our workers and their families. CSPO Watch: Noting that schooling is offered, I assume this is given free of charge to children of workers. Are the school supplies or uniforms given free as well? What would the costs be for a local person to send their child to school if they didn't have the facilities offered by Feronia? Feronia - In 2010, the Congolese Government decreed a gradual transition towards free and compulsory primary education for all children. However, the implementation of policy has not been widespread, especially in remote parts of the country. We work to provide access to good-quality primary education for our employees’ children, and ensure that good-quality secondary education is also affordable. We pay school fees for the children of our management grade workers, for up to three children for primary and secondary school. Financial assistance for schooling is also available upon request to permanent workers whose children are registered in an officially recognised school. In addition, we provide materials and workers to repair and maintain primary school buildings, provide educational materials and are assisting with the construction of new schools through our community development programmes and social agreements with communities. CSPO Watch: Noting company contributions to communities outside of Feronia related persons, the company sounds more like a social effort which justifies the inclusion of the CDC as a stakeholder. - Further noting Feronia's contribution to the self sufficiency of the DRC's need of vegetable oils is exemplary in meeting the wider needs of impoverished peoples, are there any plans to expand operations to increase this positive impact? Feronia - We are not a “social effort”. We are a commercial organisation. However, since Feronia acquired its DRC palm oil business in 2009, its objective has remained unchanged: we want to make things as they should be; for economic, social, environmental and moral reasons. This mind-set naturally resonates with our DFI stakeholders, such as CDC Group, who see the potential we have to create meaningful livelihoods, development and opportunity in one of the poorest and most under developed countries in the world. - Our current focus is firmly on making our existing operations profitable. However, several other abandoned oil palm plantations in the DRC, it is not inconceivable that we may look to replicate what we have achieved so far on other former plantation sites. That would be some time away though. CSPO Watch: Noting that current plantations are on previous farmlands, are there opportunities to further expand without risking deforestation? - What is Feronia's position on needed deforestation should a situation arise where communities living in forested areas ask for oil palm development? Feronia - We are firmly against deforestation and are only interested in replanting areas formerly planted with oil palm or other agricultural crops. - The opportunity to expand would be via the acquisition of additional abandoned oil palm plantations – not through deforestation. CSPO Watch: Noting Feronia's stock price at 0.25 cents presently with recent highs of $1.25. Also noting the current call from institutional investors for the industry to clean itself up but have not shown a willingness to invest into companies that are doing palm right but not showing needed profit levels, what would Feronia say to these green investors? Feronia - Our shares are extremely tightly held with less than 5% “free float”/95% owned by three shareholders. As a result, our shares seldom trade and our share price is not a true reflection of the value of the company. - As green agricultural investments go, palm oil is the most “green” oil seed crop there is – it has the highest yield per hectare of any oil seed crop and uses far less pesticide, herbicide, fossil fuel and fertiliser per tonne than oil seed crops such as soya and colza. Palm, oil also has the highest level of monitoring/scrutiny amongst all crops, industry standards and huge developmental/poverty alleviation potential. Whilst some of the criticism levied at palm oil is entirely justified, many producers, Feronia included, take their responsibility towards sustainability incredibly seriously and are “doing palm oil the right way”.